Dana White message to UFC Fighters: "If you want to hand pick fights, don't sign with the UFC"
Over the most recent years, the UFC in alot of fans eyes, has turned into a political sess pool. Many fans believe it has transformed into a more sports entertainment money brand as opposed to the pure mixed martial arts fighting organization of it originally made it’s name for. A major cause for these happenings could be aimed towards the UFC’s new ownership WME-IME, a company known for supporting different forms of entertainment. Since the brand’s purchase of the UFC back in the summer of 2016, the dynamic in the company has changed in terms of competition with the focus being more on marketability, ratings, and ticket sales than good ole fashioned competition. With this trend, we have seen today’s UFC stars become more money hungry than ever, even going so far as to opt out of fighting the originally booked contest for various reasons to include low pay range, financial gain, or unguaranteed title shots. 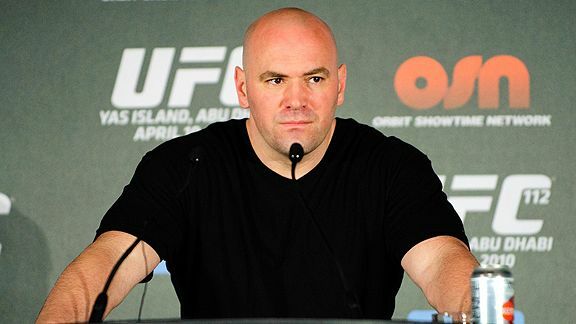 However, UFC President Dana White has made his stance on the issue and plans to bring back the rule of old of you fight anybody, anywhere, anytime, and end this new school trend of pick-a-fight. A prime example of this issue occurred last month when UFC featherweight Yair Rodriguez caught heat with Dana White and UFC brass by turning down multiple fights offered to him from the company. Infuriated by the defiant gesture, White made intentions to fire the young prospect but in the end a resolution was made, cooler heads prevailed and Rodriguez will be making his UFC return. It was after that incident with Rodriguez that lead to White taking a new more stern aggressive approach when comes to his fights having leeway over their careers. To further express his frustrations over the issue of fighters backing out of fighters certain opponents, White made another appearance on the UFC Unfiltered Podcast, and stated that should these things continue to transpire more fighters could be out of a job. “Listen, I get into these things where this is the fight business and the UFC is the elite of the elite in mixed martial arts,” White said. “You get into these situations where you get these guys that don’t want to fight certain people and if you don’t want to fight certain people, this probably isn’t the place for you. This isn’t the 1st time Dana White has endured this type of crisis of fighters longing for more career control, back in the earlier years of the UFC he’d often come into conflict with UFC Hall of Famer Randy Couture over the same issue, but even with going through that back then, White says he’s never dealt with his fighters trying to hand pick their opponents. In the end, with all the friction White’s had with his fighters who do intentionally wanna pick an choose they compete against, White has one simple message, go get paid elsewhere. What do you think of Dana White putting his foot down on UFC fighters hand picking opponents?